Eokomoko.online is the PUP that uses misleading techniques to prevent removal. Use Reimage to locate malicious components and get rid of them faster than with uninstall instructions. A full system scan blocks virus reappearance and prevents traffic to malicious domains. 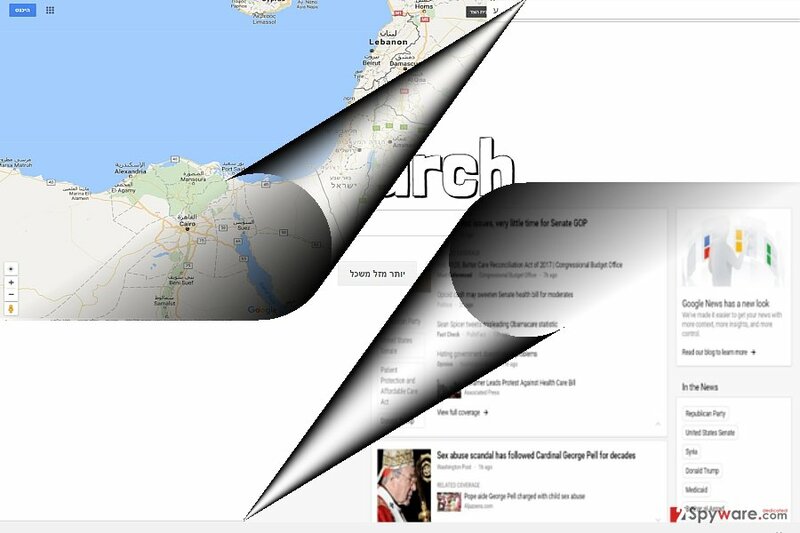 Eokomoko.online virus functions as a search engine which in overall targets netizens in the Near East. Corresponding to the alphabet used in the country, European users may find it quite odd. All the functional buttons are presented in the Lebanese. Furthermore, the search results come on the right side in contrast to popular European search engines. Though the search tool seems to be closely related to Google database, in fact, the browsing tool is classified as a potentially unwanted application, or more specifically, a browser hijacker. When you click on the above three buttons, you get redirected to Google homepage. It is unsure why there are three buttons even if they perform the same function. Furthermore, it delivers fewer search results than the original search engine. 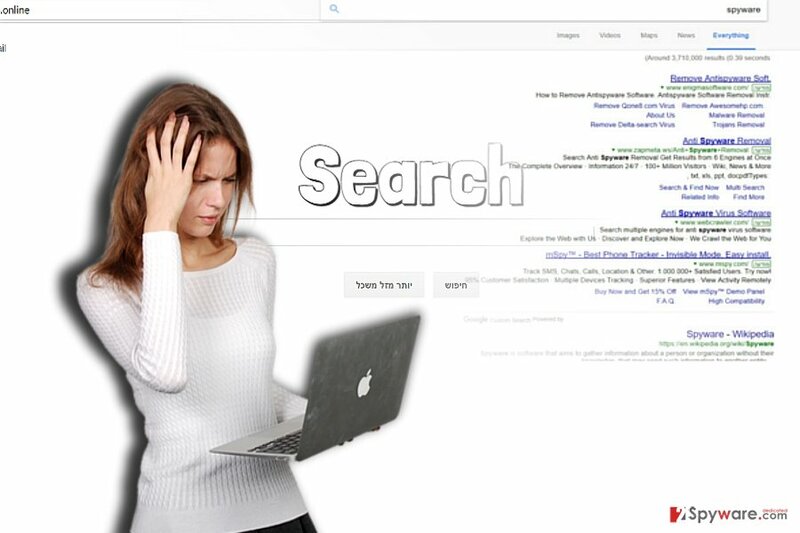 You might ask yourself why to opt for this fishy tool when you can use a legitimate and well-trusted search provider. You can remove Eokomoko.online manually or automatically with the assistance of Reimage. Previously, the almost absolute majority of alternative search tools were oriented at English users. However, the idea of making an easy profit is universal. Thus, you may find more and more search results which target other linguistic audiences. Eokomoko.online happens to be quite exceptional as it orients at Lebanese users. Users should be aware what tracking tools the web page employs. Furthermore, a legitimate website, even if it tracks users’ online activities, it should ensure users’ online privacy. However, since the website does not contain such document, it is likely that your non-personal data might be transmitted to third parties. In overall, it is not surprising if your browsing sessions will be interrupted with pop-ups. Finally, you might also get bothered by an annoying Eokomoko.online redirect to the phenomenon. You may be directed to insecure domains. While there are dozens of quite aggressive hijackers, which takes you by surprise while you are browsing and suggest installing their affiliated products, now browser hijackers tend to be less troublesome. Thus, this sort of infection behaves similarly as well. You can find this hijacker on its official website. However, there is also a possibility of Eokomoko.online hijack when you install a new application. Even if you installing a well-known program, make sure you attentively proceed through the installation wizard stages. Choose “Advanced” instead of “Recommended,” and remove the checkmarks from irrelevant add-ons. Now let us move on Eokomoko.online removal section. Eokomoko.online delivers search results in an unusual word. You can get rid of this hijacker whether you use Internet Explorer, Chrome, or Mozilla. Luckily, this hijacker does not ask you to install it. On the other hand, it does not mean that you may occasionally be redirected to this web page. If this behavior bothers you, you can remove Eokomoko.online virus and its cookies with the assistance of an anti-malware tool. Below the article, you will find useful tips how to clean the browser from affiliated web scripts and complete Eokomoko.online. On the final note, this hijacker may target also netizens of other countries, for instance, Croatia. Here, look for Eokomoko.online or any other recently installed suspicious programs. Wait until you see Applications folder and look for Eokomoko.online or any other suspicious programs on it. Now right click on every of such entries and select Move to Trash. Carefully proceed to every step to eliminate all delete Eokomoko.online scripts. When in the new window, check Delete personal settings and select Reset again to complete Eokomoko.online removal. Once these steps are finished, Eokomoko.online should be removed from your Microsoft Edge browser. Here, select Eokomoko.online and other questionable plugins. Click Remove to delete these entries. Now you will see Reset Firefox to its default state message with Reset Firefox button. Click this button for several times and complete Eokomoko.online removal. Here, select Eokomoko.online and other malicious plugins and select trash icon to delete these entries. Click Reset to confirm this action and complete Eokomoko.online removal. Here, select Extensions and look for Eokomoko.online or other suspicious entries. Click on the Uninstall button to get rid each of them. Here, look at the Homepage field. If it was altered by Eokomoko.online, remove unwanted link and enter the one that you want to use for your searches. Remember to include the "http://" before typing in the address of the page. Now you will see a detailed dialog window filled with reset options. All of those options are usually checked, but you can specify which of them you want to reset. Click the Reset button to complete Eokomoko.online removal process. ^ Conor Friedersdorf . What Do You Tell Your Kids About Online Privacy?. TheAtlantic. World Edition. ^ George Slefo.. Google Chrome Will Automatically Block Annoying Ads. Advertising Age. Advertising and Marketing News. ^ Uklanjanje računalnih virusa. IT vijesti i vodiče Virus uklanjanje. This entry was posted on 2017-06-29 at 08:06 and is filed under Stealing programs, Viruses. You can quickly scan the QR code with your mobile device and have Eokomoko.online virus manual removal instructions right in your pocket. How did you remove Eokomoko.online virus?